About seven years ago, Niagara Casinos began to catalogue its disability costs to help create a healthier workplace and to lower benefit costs. “We took a very holistic view of some areas that had been very siloed: health and safety, disability, and comp and benefits — they were all functioning as their own units,” says Colleen Falco, director of HR services at Niagara Casinos in Niagara Falls, Ont. Each year, the HR department compiles a “top-box report,” which is the top-three causes of disability, workplace incidents, prescriptions being used by volume, and prescriptions being used by cost, says Falco. As the company undertook various programs to help employees become healthier, positive results began trickling in. “As we started to see measurable results in terms of cost reduction, we were able to grow the budget slightly, and then a little bit more each year — to the point where we now have a full-fledged wellness program,” says Falco. Each year, the company educates its 4,200 employees about various diseases and conditions to create a healthier workforce, she says. “Last year, one thing that went really well was during diabetes week in November, we offered free blood-glucose screenings for all of our associates. And, at the same time, we did a healthy snack pop-up,” said Lindsay Daw, disability services manager at Niagara Casinos. “Also during that time, we held a healthy cooking class. 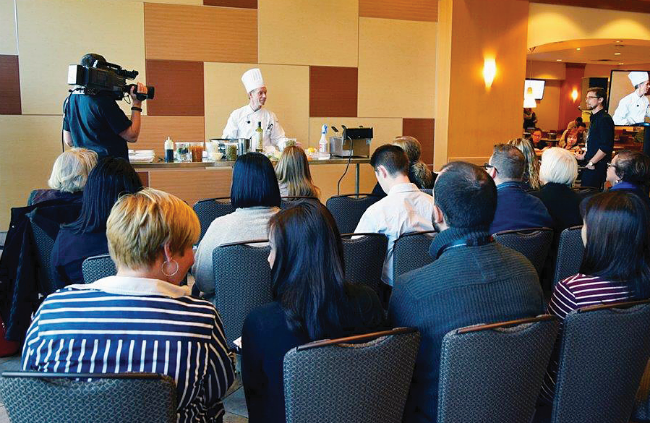 We had our executive chefs do a demonstration in our cafeteria, and participants all got to try the food that they were cooking, and (the chefs) handed out the recipes so people can make them at home themselves,” said Daw. Last year, the company discovered infectious diseases was one of the most expensive portions of the overall benefit costs, she says. The volume of the various initiatives is widespread and ongoing, says Daw. “We had a bike-to-work day which we thought was really well-received,” says Daw. Constantly communicating the good health information to employees is a critical part of the program’s overall success. The company also measures the results in many ways, not just via bottom-line savings from decreased benefits premiums, says Daw. In the future, Niagara Casinos will continue to hammer home the healthy message, says Daw. The healthy workplace efforts are the domain of the HR department, according to Falco. “It’s been very well-received and adopted and supported by management throughout the organization, throughout all levels, and the employees really appreciate it,” says Falco.